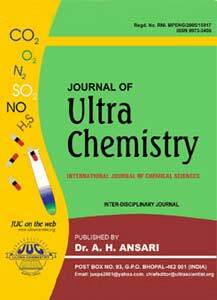 Journal of Ultra Chemistry is now in its 15th successful year of publication. JUC publishes high quality original research papers, review articles and short communications rapidly in all the areas of pure and applied chemistry, chemical sciences and chemical engineering The publication of Journal of Ultra Chemistry is from Orient south east Asian region, Bhopal India. For more information kindly see Aims & Scope.